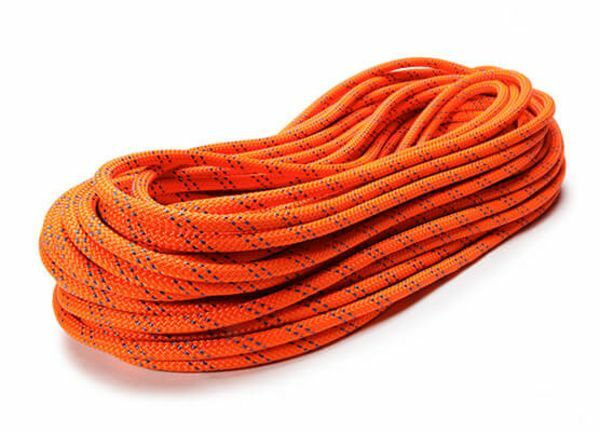 KM III is an exceptional static rope for rappelling, caving, rescue, top roping, fixed rope applications, hauling, lifting and life safety applications. The unique polyester cover limits rotation, bouncing and stretch. KM III is an highly static rope that is perfectly suited for rappelling, caving, rescue or top roping. Also fixed rope applications, hauling and lifting systems, and life safety applications can be well covered by KM III – a true jack-of-all-trades. In climbing, KM III is the right choice when it comes to hauling equipment in big walls or rappelling in climbing photography. The polyester cover of KM III is balanced with a polyamide (Nylon) core to limit rotation, bouncing, and stretch. Our KM III, formerly known as New England Ropes’ KM III is NFPA and CE certified. Thirty-two bobbins produce the right cover for the unique demands required of this static rope and the optimum cover/core ratio. This creates an incredibly smooth cover with higher tensile strengths, and superior handling characteristics. KMIII is available in 5/16”, 3/8”, 13/23”, 27/64”, 7/16”, 1/2” and 5/8” diameters (8mm, 9.5mm, 10mm, 10.5mm, 11mm, 13mm and 14.5mm) and in standard lengths ranging from 100’ (30m) to over a mile (>1600m). Custom lengths are available upon requests. KMIII has been the industry standard for life safety ropes for nearly 50 years. It is humbling to realize how many lives this rope has help save and how many people have been kept safe as a result of this great rope. With a pedigree like that, why would you trust your life to anything else?